Jubilee hit the water for the first time yesterday and floated nicely, only taking in modest amounts of water considering how long she has been dry. Geoff and I took her out under sweep oars with Marilyn coxing, and she goes jolly fast, as you might expect from a boat 20ft long but only 3ft 6in beam. 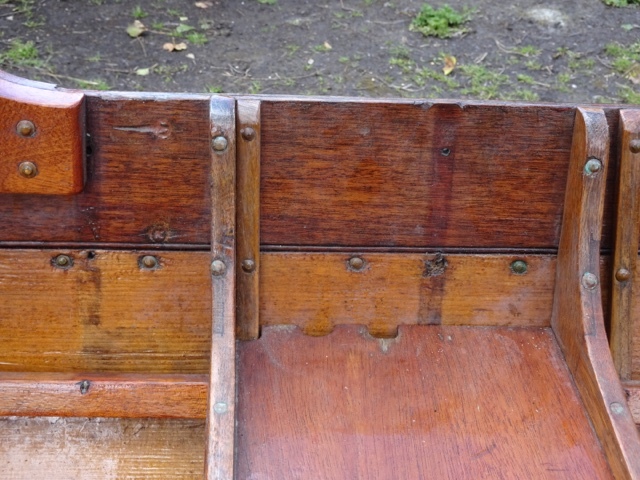 However...the rowing positions are so far aft she trims bow up and the water is up to the top two strakes in the stern. It is a mystery why the crew are placed so far astern, especially as the arrangement leaves a huge empty space in the bow and crams the cox'n into a space so small they have no room for their feet. The sculling rig was a total failure as we don't have any blades short enough. This morning I took a closer look at her and discovered some interesting evidence of the way she has been modified over the years. Was she originally a coxless pair? If so, why the huge empty space up forward? And why does she have alternative rigging as a double scull? Anybody know what Jubilee might have been originally built as? I have absolutely no idea... but she is a lovely looking boat... just a couple of thoughts - forward facing cox originally????? Three rowing positions instead of two???? Could she have been designed, or perhaps later modified, for a lightweight cox positioned forward of the oarsmen? I have seen pictures of boats configured this way, but know nothing of what the concept was supposed to achieve nor whether there was ever any advantage to it. Possibly not coxed at all, and just as likely to have been a coxless double as a pair. Is it possible that the decking was also a later addition ? 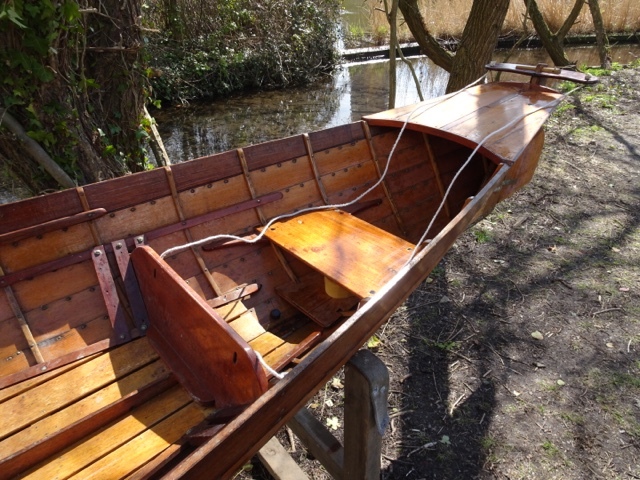 Have you tried rowing her without a Cox at all, to see what that does to the trim. Looking at the shape of the hull, her bow is quite fine, so although you seem to have quite a but of space forward, you probably couldn't carry too much weight there? Can't imagine why the thwarts would have been moved (did you say forward or aft?) unless she was regularly used to carry some weight in the bows. I agree with previous comments, can't imagine she'd have been built originally without any regard to trim.